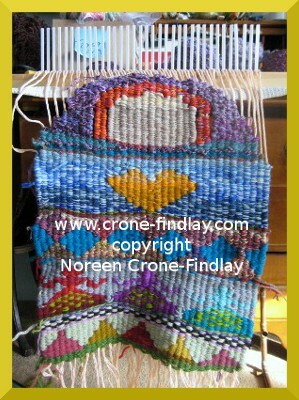 Oh, Noreen, your weaving is stunning! 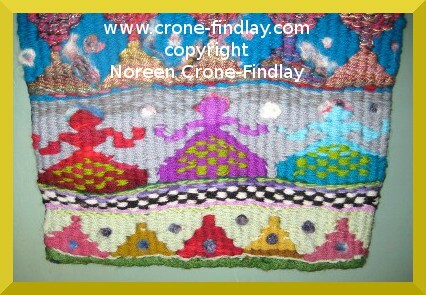 I just love the bright colours and the felting on your pattern. Your new peg loom has been beautifully and lovingly utilized for its first project. Thank you so much, Jan!!! I really appreciate your kind comment! It’s always an anxious moment to put up photos of a new piece! Love your weaving. Thanks for keeping me on your mailing list. Love it! The needle-felting is inspired. Can’t wait to see more of your Women – perfect timing for their appearance, Women’s History Month! Ah! I had forgotten that it’s women’s history (herstory) month! OK, please stop the music. I’ve been very intrigued with stick looms before but didn’t know that you could do the discontinuous weaving found in tapestry! How wonderful! But how do you do it? LOL! You had me baffled, Diane! 😀 I thought it was a new slang that I hadn’t heard yet!!!! You said in a March comment that you may do tutorial in the future about discontinuous weaving on a peg loom. Did you ever get around to this? Sorry, Kristen, I have been rushed off my feet… so I haven’t had a chance to get to it yet. I see you don’t want people to Pin from your site. I think I Pinned something from you awhile back, so I will try to find it and remove it. If you can add a bit of code to your blog template, you can just block any Pinning automatically. “What if I don’t want images from my site to be pinned? OOps, the code didn’t show up. Thanks, Zann. It’s my gallery pieces, especially, the Woven Women series that I am most concerned about. I really don’t mind people pinning pictures of my designs and patterns, but it concerns me that once an image is pinned and re-pinned, it becomes the property of Pinterest and they can do what they want with it, and the link leads back to Pinterest, not to the original creator of the image. I have balked at joining Pinterest because of the policy that gives them full access to your FB account and allows them to post AS IF THEY are you…. that sets alarm bells ringing. Also, they say that you are not supposed to pin your own work, but only pin the work of other people… and at the same time you are only supposed to pin images that you own copyright to… um? how does that make sense? 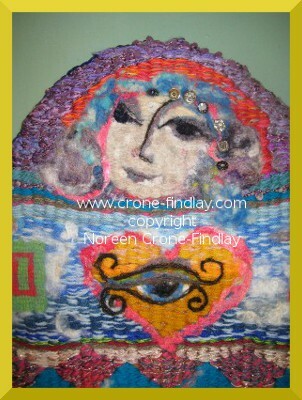 THE woven women are beautiful Noreen. You are a very creative person. 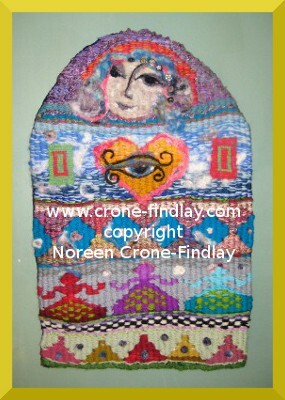 Noreen, your woven women are beautiful! I love seeing the latest one still on the peg loom and then with the felted embellishments added. I realized that I didn’t know how peg looms worked, so did some research and now I understand how the ‘Dreaming the Well’ woman was made. You are tremendously creative!! More beauty! The phrase, “in the heart of the flower” reminded me of a meditation created by two of the healers at the B.C. Cancer Agency during the time my partner was being treated for cancer. Thank you! Thank you, Aleksa! As I was weaving ‘In the Heart of the Flower’, I was definitely in a contemplative, meditative state, and it was VERY healing! Thanks, Sharon! I hope that you will enjoy your new loom!